People with diabetes are at an increased risk of developing eye diseases that can lead to vision loss and blindness; including: diabetic retinopathy, cataracts and glaucoma. In fact, diabetes is the leading cause of blindness in the United States. Diabetic eye conditions often develop without any noticeable pain or vision loss. In fact, serious damage may have already occurred by the time the patient notices any symptoms. 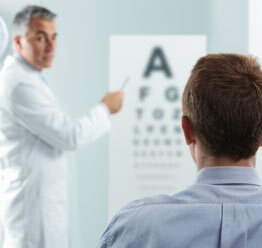 For this reason, it is very important for diabetics to have an annual comprehensive eye exam. Early detection of diabetic eye disease and prompt treatment can help prevent permanent damage. Diabetic-related eye problems develop from high blood sugar levels, which can cause damage to blood vessels in the retina (the nerve layer at the back of the eye that senses light and helps to send images to the brain). This damage is referred to as diabetic retinopathy. Over 40 percent of diabetic patients will develop some form of eye disease in their life. The risk of developing eye problems can be significantly reduced through regular eye exams and by keeping blood sugar levels and blood pressure under control through a healthy diet, regular exercise and medication.